“Selling my beloved Xpander as I am moving studios and need to drastically downsize. It is a wildly flexible and lush instrument, going from Steve Roach to Nine Inch Nails and everywhere in between. 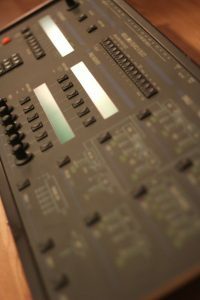 It has 5 LFOs and 5 ADSRs per voice and a computer controlled patching system that has clearly influenced just about every semi modular VA ever made, hardware or software. In terms of modulation and multi-timbrality it can do very interesting things. I like the sound of all the filter types and the oscillators. It is a beautiful sounding instrument. “Here is a chance to own a true analog beast and a highly collectible and sought-after piece of synthesizer history. “This is another awesome synth I haven’t used in a while and want to pass along to someone who will at a fair price. This U.S.-built Xpander is really special and sounds amazing and is very easy to navigate, but it’s also a programmers synth thanks to all the modulation routing options. ” This listing is for one of my beloved Oberheim Xpander (XP-1) in perfectly working in absolutely stunning condition. Please see my other listings for the other Xpander that is also for sale (with real sturdy flight case). Power supply switches easily between 115 Volt and 230 Volt. All voices tune swiftly in all categories. The Xpander is probably the most flexible vintage analog synth ever made. Full MIDI and CV/Gate implementation and separate voice outs. The Xpander is a multitimbral truly analog synth. You can even mix and match which voices should listen to CV/Gate and MIDI simultaneously! Each voice has a 15 mode (analog) filter, 5 LFO and 5 Envelopes, LAG, Tracking and RAMP generators. “One of the best synthesizer in the market with a beautiful warm and deep sound, that can make almost everything since atmospheres proper from breakbeat to warm base lines and leads. 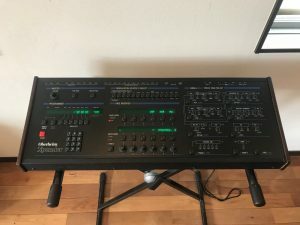 “This is an Oberheim Xpander synthesizer in great working condition. It hasn’t been used in over 20 years but was safely & carefully stored. There are some scrapes and scratches from moving around in the studio while it was being used back in the owners music days, and I have shown them all clearly in photos. Its been tested by a friend who works at a music engineering studio and everything checked out. We don’t have the original manual, and the power cable isn’t the original but it is the correct cord for the machine. I decided to leave the manual purchase up to the buyer rather than buy one and stick it with this. It is the US made version. It has had only one owner. “If you are looking at this and you’re thinking, “Didn’t I just see this a week ago?,” you’re right. I listed it, sold it, and the dude backed out of the sale. So here we are again, so be sure you know what you are bidding on! 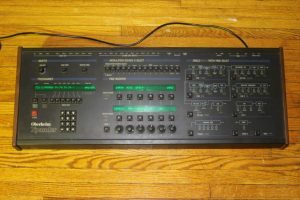 Oberheim Xpander, 6-voice synth module, not an OB8, OBx, or any other older synth. What is it? 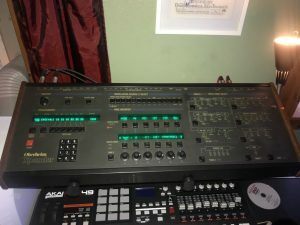 : If you know the ’80s you already know what an awesome, historic synth this is. If you want all the specs, I can send you them, but specs don’t translate to sound. And this thing has THE sound. I am the original owner, I bought it in the early ’80s when they were first introduced and I used on so many gigs. It was my go-to synth. 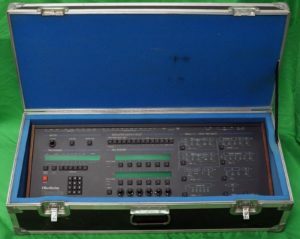 I also had a Micro Moog, Prophet-5 and a DX-7, but they were never as fat as this OB. Those huge ’80s synth sounds were so iconic, and now real analog sounds are back. BTW-this one is US built (highly sought after), not Japanese, as the later models were. “This is a well working Oberheim Xpander. It includes the Xpander Xpansion installed by a tech a long time ago. Passes all tunings consistently and only needed very minor work (PSU). ” This is an Oberheim Xpander synthesizer in excellent physical and operating condition. It has been hardly used over the past twenty-some years in a non-smoking home. It includes the original owner’s manual, service manual and power cable. I am also including a clear plastic dust cover custom made for the Xpander. “This particular unit is in great shape and has been well cared for. Synth is 100% functional and works great. Like nearly all the high end vintage analog synths we sell, this item has been METICULOUSLY disassembled, cleaned inside and out, FULLY serviced by professionals who’ve been servicing and selling vintage synths for the last 2 decades, and systematically tested multiple times over a long period to ensure it’s working exactly as it should. No BS. No ebay surprises. We are perfectionists and don’t cut corners. We paid our tech for 14 hours of tech time plus parts costs to fully overhaul this unit so it would be BETTER than the rest – clean enough to eat off of, working like new again (or better) and as reliable as possible for its next owner. This was a serious investment of time, love, and money, and was definitely worth the effort (and this is reflected in its price). If you’re looking for a great sounding example of this model that works just like it should without needing to invest hundreds or thousands of dollars in tech fees, this one should make you very happy. ” The Xpander is a huge sounding vintage analog monster. This machine is incredibly deep, essentially it’s like a 6 voice polyphonic modular with 12 oscillators, 5 envelopes, 5 LFO’s and ton more. It has recently been serviced and refurbished with a new front panel, sides and power supply. All voices function and tune correctly and it passes the diagnostics routines. A small bag of spare parts (fuses and a couple of transformers) are included with the sale. It appears this one has been modified with a voltage switch, allowing it to be switched from 100v, 115v & 130v to 200v, 220v & 240v. I’ve never had cause to use this, so I don’t know if it works or not, but could come in handy for international buyers, world tours and so on. “The Xpander is a huge sounding vintage analog monster. This machine is incredibly deep, essentially it’s like a 6 voice polyphonic modular with 8 oscillators, 5 envelopes, 5 LFO’s and ton more. It has recently been serviced and refurbished with a new front panel, sides and power supply. All voices function and tune correctly and it passes the diagnostics routines. A small bag of spare parts (fuses and a couple of transformers) are included with the sale. In spite of all the work done on it, there is still one minor issue. Certain patch locations (any with a number 9 specifically) cannot be saved to from the front panel. Saving patches works fine when doing it from a computer, the battery has been replaced and internal diagnostic routines don’t report any problems. It doesn’t seem to be a mechanical problem either as the buttons function fine otherwise. I have no idea whats causing it! “I bought this brand new back in the late 80’s. It’s pretty much been in storage (inside my home) for over 10 years now. I seriously hate to part with this great synth but since I’m just a hobbyist, and have switched over to mostly using virtual instruments, I have very little use for it anymore. It has been tested, functions perfectly and is in excellent condition. All the displays and encoders work perfectly, there is no crackling from the audio knob and it passes all internal tests. There are some scratches on the bottom but the top, front, back and wooden side panels are nearly perfect with no visible scratches and very minimal wear. If you’ve been looking for an Xpander that is in great shape, both cosmetically and electronically, I think you’d be hard pressed to find one in better condition than this one. It’s been kept in a smoke-free home studio, seen minimal use and has never been taken on the road or on stage. In my opinion, this is one of the most amazing analog synths ever made. It’s a programmer’s dream with tons of modulation options. Although it’s very feature rich, it’s all very accessible through a well designed and logical user interface. It’s capable of anything from fat basses and screaming leads to silky smooth pads and strings. It excels at creating wild sound effects and unique textures. You can also layer and split patches in various combinations. ” Oberheim Xpander XP-1 – in excellent, beautiful condition. 100% functional. All tuning passes. Nice bright displays. Latest/last firmware. Cosmetically looks fantastic. Woodend pieces look great. This is the US made model. Comes with 2 x rare CEM3374 voice/oscillator chips extra, just in case down the road it needs one. I paid $100 each for the CEM3374 since they are becoming very rare. All oscillators, filters, VCAs sound 100%!